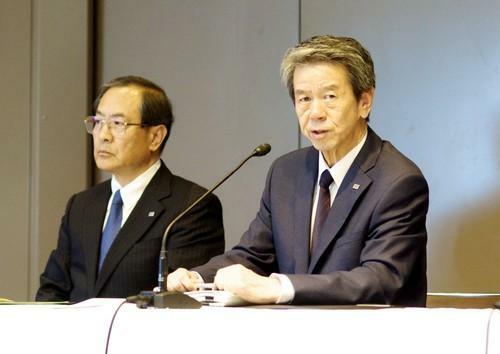 Toshiba CEO and President Hisao Tanaka (right) addresses a press conference on July 21, 2015, in Tokyo at which he resigned over an accounting scandal. Chairman Masashi Muromachi (left) replaced him. Toshiba Corporation has announced that Toshiba Group will implement a series of management measures under a Toshiba Revitalization Action Plan. This plan will include reducing its headcount by 6800, about 30 per cent of its global total. The company said by implementing and "resolutely executing this action plan", it hoped to regain the trust of shareholders, investors and all stakeholders, and to achieve a strong corporate constitution. The plan follows the announcement of a $US1.25bn accounting scandal revealed in July. The full details of its action plan as presented in a statement follow. In addition to previously announced restructuring measures, Toshiba has decided to pursue structural reform of the PC, Visual Products, and Home Appliances businesses in the Lifestyle Products and Services business segment. Through these measures, the Lifestyle business segment will reduce its headcount by 6800 employees by March 31, 2016. PC Business: Further realize low cost business operation, and consider alliances with third party companies as future option. Home Appliances Business: Further improve operational efficiencies, and consider alliance with third party companies as future option. ・Concentrate on B to B: The PC business will concentrate on its B to B business, where further global demand is expected, and build up its enterprise customer base as a means to generate healthier profit. B to C operations will concentrate on the Japanese and the US market where stable business can be expected. ・Reform of business structure: In order to transform to an operational structure that generate profits, with the downsized global sales of the scale of 3 million units a year, the number of indirect employees will be reduced, operating sites will be optimised, and business processes will be changed to reduce fixed costs. In addition, the PC business will end consignment of design and manufacturing to outside vendors, and cease buy and sell transactions. By concentrating on in-house design and manufacturing, product platforms will significantly be reduced to below one-third of the current number. ・Withdrawal from operations outside Japan: The TV business has already shifted to a brand-licensing model in North America and Europe. Business in Asia (excluding China) will also shift to this model, and ownership of the company’s TV manufacturing plant in Indonesia is planned to be transferred to a third party company. Business in the Middle East and Africa will also shift to brand-licensing model through the sale of part of the shareholdings in two joint venture companies in Egypt that respectively manufacture and sell TVs. These companies will become non-consolidated companies of Toshiba. ・Reform of business structures in Japan: In Japan, the TV business will reduce fixed costs and strengthen profitability by enhancing development efficiency and reducing the number of indirect employees. It will also downsize TV sales to the scale of 600 thousand units a year, and concentrating on profitable high-end models. ・Reform of business structure: The Home Appliance Business will cut fixed costs by reducing the number of indirect employees globally, optimising operating sites in Japan, and improving operational efficiency. ・Withdrawal from the sales and production of twin-tub washing machineS: Manufacturing of twin-tub washing machines will end at the production facility located within the same site as TV manufacturing plant in Indonesia, which will be also transferred to a third party. As a result, Toshiba will end sales of twin-tub washing machines in Japan and other countries. close and sell Ome Complex in Japan. under consideration will be announced promptly after they have been finalized. part of the measures to prevent recurrence of inappropriate accounting. Within the process of developing mid-term plans, starting from FY2016, the Company will discuss the following items and finalize the plan by the end of March 2016. The Company plans to announce its management policy at the same time as it completes the next mid-term plan. ・The Company had redefined its focus business areas, and concluded that it will focus on the energy and storage businesses. ・The Healthcare business has achieved high profitability and a global presence in diagnostic imaging. However, securing further business growth requires the allocation of sufficient business resources for research and development and others. Given this, the Company has decided that, in order for the Healthcare business to realize its potential to the full, and to maximize its value to the full, the best solution is to invite outside majority shareholder(s) to make sufficient support for the Healthcare business. This will also, at the same time, strengthen Toshiba’s balance sheet. Toshiba Corporation and Toshiba Medical Systems Corporation will collaboratively give immediate priority to executing this plan. efficiency. At the same time, in support of the operational shift to independent autonomous management of the in-house companies, functions needed for business operations will be transferred to the in-house companies. Through these measures, the Company aims to establish a small but strong corporate function, and has also decided to implement a personnel rationalization program, including an early retirement incentive program targeting corporate staff members. With this program, and by reviewing activity expenses, the corporate headcount will decrease by about 1000 and operating costs will be cut by approximately 20 billion yen by Marc2016. ・The company will focus on cash flow in planning mid-term business plans, budgets, business performance management and business performance evaluation, and also strengthen management of interest-bearing liabilities by the in-house companies. Reflecting on the fact that it fell into an overriding concern for current profit, the Company will continue to promote business management emphasizing cash flow, and give first priority to restructuring for recovery from a weakened financial platform. The company will set firm rules on limits to investments and make resource allocations based on the redefined business portfolio and in those business domains that will generate cash. Under this policy, the company will focus its FY2016 investments on the Energy and Storage businesses, and limit investments in other areas to refurbishment. Toshiba will also reinforce management of interest-bearing debt on a consolidated basis by the in-house companies so that it will be able to reduce interest-bearing debt. their necessity, and consider selling them off, without any restrictions.